"Over the years I have seen the software development pendulum swing from one extreme to the other, as deficiencies in 'best practices' at one end of the spectrum spawned a new set of 'best practices' at the opposite end. Kevin Tate's book has finally brought the pendulum to a screeching halt, right about dead center. This book provides a balanced and practical guide to what's important if your goal is to develop software that lasts." --Mary Poppendieck, Poppendieck.LLC. Author of "Lean Software Development" "1) In this very practical and accessible book interspersed with real-world examples and personal opinions, Kevin has distilled his years of developing quality software into a set of principles and practices that have been proven to work. If you are thinking of introducing an agile development environment (ADE) into your organization or of improving the one you already have, this book will help you clearly understand the benefits of a sustainable ADE, establish the practices to make it happen and coach you through the follow-up required to change the culture of your organization to make sure the changes take hold.I am currently faced with exactly this challenge and this book has already given me several ideas I am looking forward to trying out. 2) In an industry plagued with missed deadlines despite long overtime hours, this book offers a refreshing alternative: a set of guiding principles and simple practices to follow that allow you to get the job done by working smarter, not harder. Drawing on the author's extensive experience developing quality software, the book clearly explains the principles behind a sustainable agile development environment, why it works, the practices to make it happen and the follow through required to turn these practices into habits." --Peter Schoeler, Technical Director, Artificial Mind & Movement "It's a familiar scene--the schedule's tight, people are putting in heroic efforts to get everything done, then at the last minute a change request comes in that wipes out the gains you had finally managed to make in meeting your ship date. Looks like it's pizza at your desk for the weekend again! An unfortunate situation to be in but a pattern that repeats itself all too often. "Sustainable Software Development" offers hope to break this cycle.It shows how a change in mindset can free you from the tyranny of unrealistic expectations and brings development realities out onto the table for everyone to see. By following these techniques you will be able to define and manage a software development environment that will work for the long haul." --Kevin Picott Software development for immediate success and long-term sustainability Sustainable Software Development brings together principles and practices for building software that is technically superior, delivers exceptional business value, and can evolve rapidly to reflect any change to your business or technical environment. 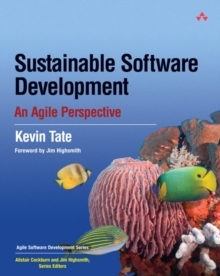 Kevin Tate shows how to eliminate practices that make development unsustainable and replaces these practices with a sustainable approach that draws on the best ideas from both agile and conventional development. Tate demonstrates how to balance rapid releases and long-term sustainability, achieving both rich functionality and superior quality. You'll learn how to build a development organization that is more productive and can continually improve its capability to handle complexity and change.Writing for developers, architects, project leaders, and other software team members, Tate shows how to: * Take control of your development environment, so you can outship your competitors, leveraging new technologies and responding to new business opportunities * Maintain a consistent pace that optimally balances short- versus long-term requirements * Keep your code base in a "near-shippable" state between releases * Prevent defects, rather than just recognizing and fixing them * Invest continually and cost-effectively in software design improvements * Leverage the fundamentals of the craft of software development * Integrate sustainable processes with Agile and traditional methodologies A(c) Copyright Pearson Education. All rights reserved.